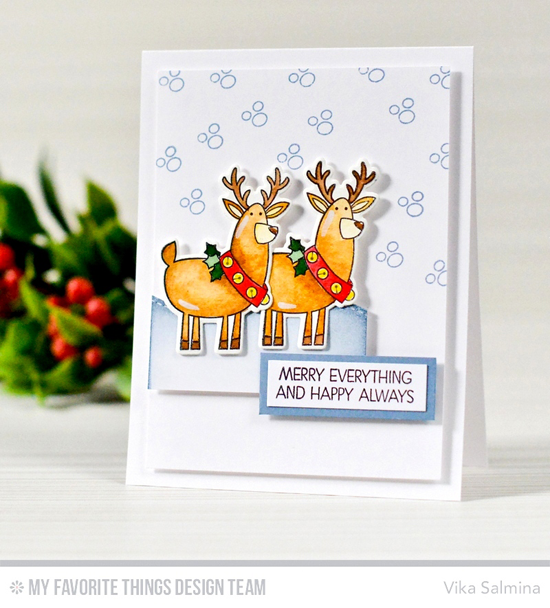 Welcome to a new sketch from the MFT Challenge & Inspiration Blog. We're so glad you've decided to pay us a visit, and we hope that you'll be inspired! Below you'll find Sketch 303. Create cards, scrapbook layouts, home decor, treat containers, mixed media, etc. using this week's sketch and be sure to link your project below for a chance at the weekly My Favorite Things Gift Voucher worth up to $20. The My Favorite Things Creative Team has been busy getting creative! Let's see what they have up their sleeves for Sketch 303! 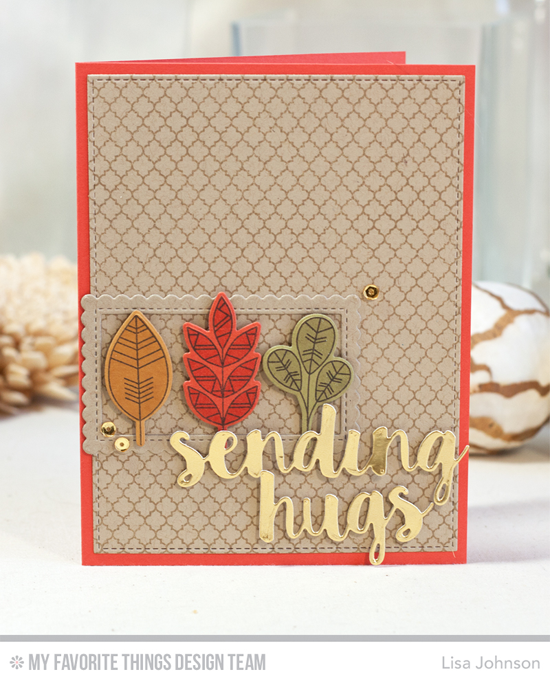 Lisa features three pretty leaves from the Geometric Greenery set in the rectangle of the sketch and pops up a pretty gold sentiment in place of the flag. Her warm autumn color choices and hints of metallic gold make this a lovely design. 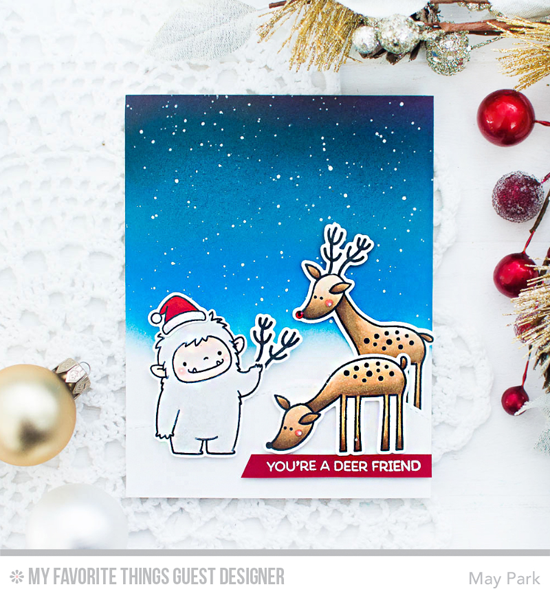 May saw the vast expanse of the upper portion of the sketch as a starry sky which sets the scene for a friendly encounter between one adorable yeti and two sweet deer. The bold red sentiment gives this design the perfect amount of weight to achieve balance. 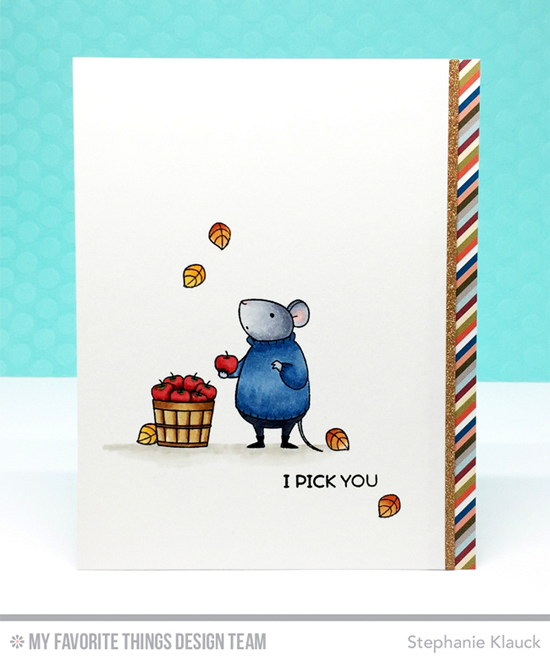 Stephanie's design is simple and sweet. She hints at the sketch by stamping the mouse and bushel of apples in a rectangular position and the sentiment situated to the right. The leaves mimic the scattered dots of the sketch, and her addition of a slim strip of sparkle and striped patterned paper give her design a finishing touch. 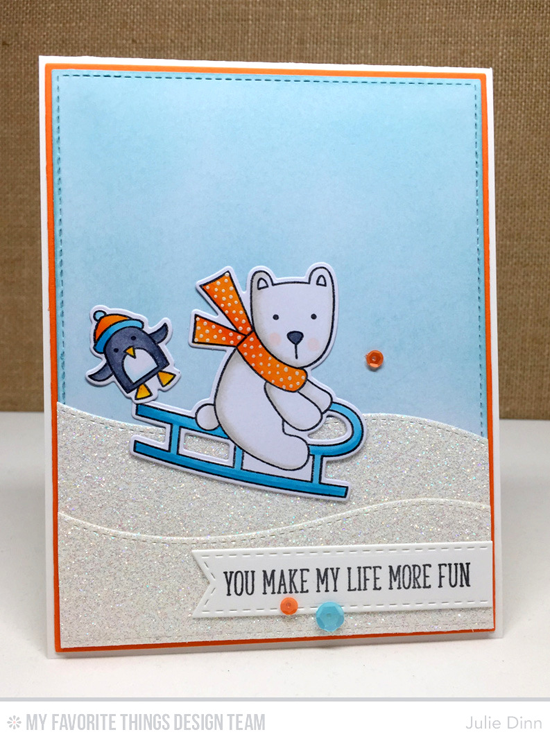 Julie utilized the adorable Cooler with You Card Kit (just released a few hours ago) on this sweet wintry design. The festive bear and tottering penguin make up the "rectangle" of the sketch. I'm not going to lie — I love how she used orange rather than the expected winter red. And that dotted scarf is THE BEST. Like May, Torico seized the opportunity to create a night sky for sketch 303. Her rich color choices for the background make the cute owls from the Fall Friends stamp set stand out, and the heat embossed sentiment looks phenomenal on her Cranberry Cocktail flag. 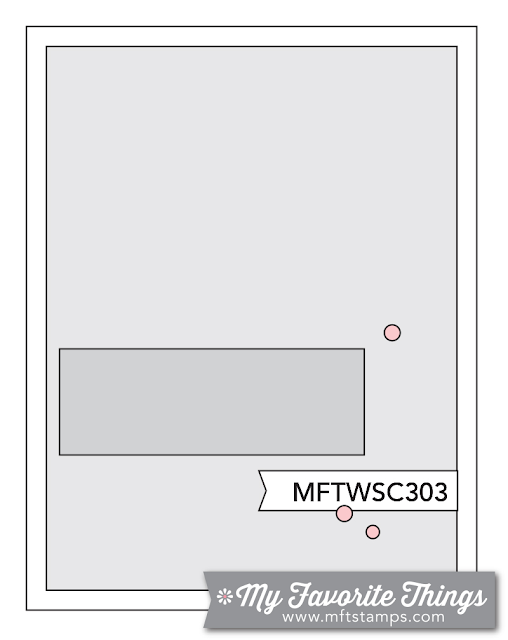 The rectangle on Vika's interpretation of sketch 303 is occupied by two sweet deer from the Merry Everything stamp set. They look ready for a December 24th night of adventure with Santa Claus! Francine flips the sketch upside down for her dignified design. 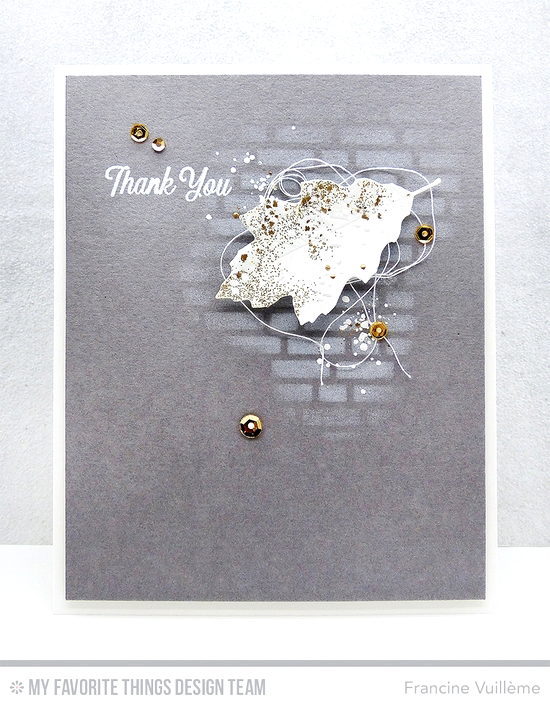 There's a majestic and artistic feel to this simple card featuring the Falling Leaves Die-namics and English Brick Wall stencil. Congratulations, Rosemary D! You are the randomly selected winner of last week’s sketch challenge. You can view all the entries for last week’s challenge HERE. You have until Tuesday, October 25th, at noon EDT to add your link and be eligible for the prize of up to $20 in MFT Cash to be spent in the MFT boutique. Winners are chosen at random, so everyone has a chance! The weekly prize is a $15 Gift Voucher to My Favorite Things, but if you use MFT stamps and/or dies in your project, you’ll receive an extra $5. Yay! Can't wait to see what you create!